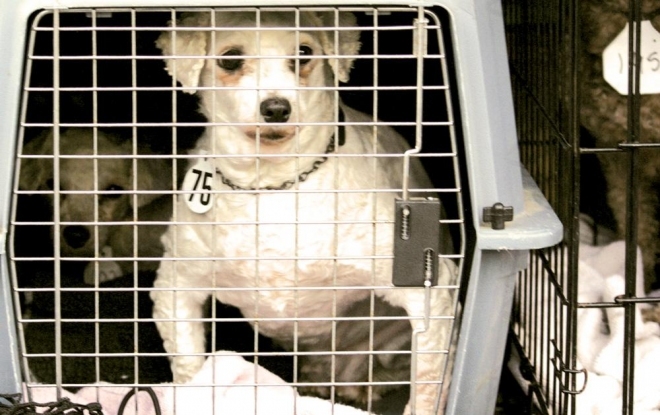 Pebbles spent eight years bearing litters at a Minnesota puppymill, before being sold at the Ohio Dog Auction. Photo by Konstantin Vasserman. We’ve got three ‘02-model females,” the auctioneer began. A seated crowd of bonnets and wide-brim hats peered down into the auction pit, where three small white dogs stood on a rug-covered table. A teenage boy held each one in place. Auction lots 73-75, three Bichon Frises registered under the names Mandy, Crystal, and Pebbles, were shaking. Maybe they felt cold, or maybe they felt scared. It was a January morning, their curls had been shorn off and until that moment they had been tasked with bearing litters of puppies in a large breeding facility known for its small cages, where they had probably never felt so many human eyes upon them. Mandy’s ears froze into an odd crimp, as the auctioneer announced the starting price for her. There were no takers. The price dropped, then dropped again several times, and he gave up. Crystal, a runt, fared the same. The third, Pebbles, whose short legs bowed awkwardly around her tomato-shaped body, fetched a single bid: $5. The three mothers were among 301 dogs who rode 900 miles last January inside cage-stacked semi tractor-trailer trucks, from Clearwater Kennel in Cushing, Minn., to the Farmerstown Sale Barn in the Amish town of Baltic, Ohio.